The video system in a courtroom has an important and specialized job. Fundamentally, it should be able to provide accurate views of the courtroom at different locations to create a clear image that can serve as the official (or supplement to the official) court record. The method of making such a court record should be an easy process. It should not take a lot of the court’s effort to make it happen, nor be so technically complicated that specially trained operators must be available to make the recording method work. 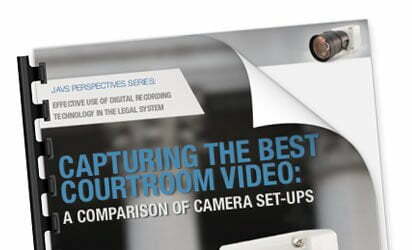 In this white paper, Julie Helling explains the difference between a few different courtroom camera options, and the advantages of each one. Have more questions, or need an AV integration specialist to help guide you through camera setups in your courtroom? Contact us today and our team of dedicated technicians will work with you to make sure you get the setup that's right for your needs.